A new report prepared by the Coalition for Fair Labor, Forced Labor at NYU Abu Dhabi: Compliance and the Global University, clearly documents New York University's labor violations in the construction and operations of its Abu Dhabi campus over the last 9 years. In addition to permitting forced labor conditions for tens of thousands of migrant workers, NYU Abu Dhabi arguably owes workers several million dollars in overdue compensation and continues to put hundreds of workers at risk. This new report is the first complete record of publicly known information about labor at NYU Abu Dhabi, and concludes that NYU is still falling far short of implementing the fair standards, due diligence, and best practices that are expected from a university with a global network of overseas campuses. This report is the first public document to analyze the issue of forced labor in the context of the construction and operations of NYU Abu Dhabi. In construction of its campus from 2010 to 2014, NYU Abu Dhabi likely allowed forced labor conditions for up to 30,000 workers — its entire construction workforce. Forced labor is not only a grave ethical violation, it is a violation of international law and UAE law. For its current operational workforce, NYU Abu Dhabi remains far below standard practices for addressing forced labor, creating an ongoing and avoidable risk of forced labor through present day. 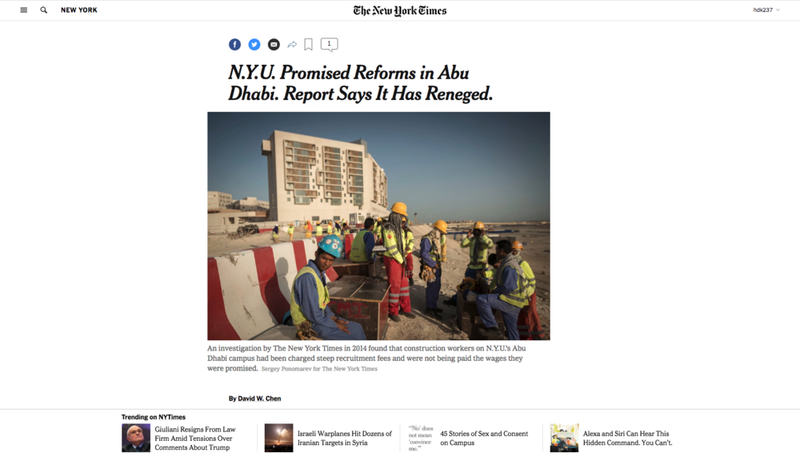 NYU Abu Dhabi has not paid in recruitment costs and fees amounting to several million dollars it promised would be reimbursed in 2009 and which were not paid in a "significant error," according to a 2015 investigation. In contrast, the single best practice among multinationals is to reimburse such costs and fees; for 30,000 comparable workers in its supply chain, Apple paid $21 million, and FIFA 2022 World Cup stadium contractors in Qatar have committed to $5 million. We think that an institution that aims to be a Global Network University should be able to support a 21st century global architecture of compliance that can guarantee certain minimums of treatment. Comply with relevant UAE laws, including UAE law prohibiting forced labor. Assess the risk of forced labor at NYU Abu Dhabi, with professional expertise from an independently appointed entity. Eliminate the risk of forced labor to the greatest extent possible through labor standards consistent with relevant best practices. Track implementation. In response to media inquiries raised as a result of this report, NYU Abu Dhabi released a public monitoring report on May 9, 2016 that does not monitor forced labor and is two years late. Remedy violations. NYU Abu Dhabi has been involved with serious harms that are in violation of relevant law. NYU Abu Dhabi has an obligation to remedy harms for those workers actually affected, to acknowledge the harms, and to commit to non-repetition. "If you’re going to educate ethical leaders for the world, the first thing you have to do is make sure that the university is itself a model of ethical behavior and of ethical treatment of people more particularly." Journalists: please see our press kit or contact us at forcedlaboratnyuad@gmail.com. This report is written by the Coalition for Fair Labor. Primary author is Sahiba Gill, J.D. Candidate '18, NYU School of Law. Many thanks to support from the NYU Gallatin Human Rights Initiative as well as to those who contributed research and editing to this report, including Alex Boodrookas, Nora Christiani, Dierdre Dugoleski, Hannah Fullerton, Tess Graham, Samah McGona Sisay, Audrey-Marie Winn, and Mia Wong. Victoria Grubbs, Selene Nafisi, Fernanda Nunes, Alejandro Villa Vasquez, and Suraiya Zubair-Banu provided copy editing and cite checking. Harris Kornstein provided the graphic design and Nitasha Dhillon provided art.